Mac has struggled with articulating his "k" and "g" sounds since, well, forever. He occasionally says other sounds wrong...but I think he's just being lazy with those. When Mac was between 2.5 and 3 years old, my friend Jess, who is a speech therapist for young children, told me not to even really think about it until he is 4 because they most likely wouldn't do anything to correct it until then anyway. Okay, easier said than done, but she's the expert and I totally trust her and her advice. Move forward about a year and last spring, Mac had his Kindergarten screening and they flagged him for articulation (duh!). 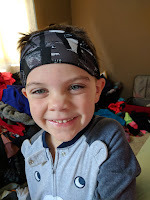 But since he turned 4 over the summer, they had me come in at the end of school last year to get everything set up to test him this fall, if it were still an issue. It is/was. Well, that testing happened over the last month and the school speech therapist called today with the results...he doesn't qualify for services. Now a bunch of conflicting emotions went through me. I'm so happy he isn't "bad" enough to need services, but I feel like he still needs help, so now we are stuck int he middle in "no man's land." I talked with her for a bit, which was somewhat helpful. I'll get the actual report on Wed, but she said to qualify you need to score 70 (percent, I'm assuming) and Mac scored 90. Again, good news! She said that once they test you, they won't test again for a year and she thinks once he's in Kindergarten, it will all come...but we could test again at any point during his next school year. The older you get, the threshold for qualification changes (which is why they waited until 4 to test him to begin with!). Mac's pediatrician told me at his well child appointment that at this age, if they can understand over 75% of their speech, they usually aren't worried. And I think most people can understand almost 100% of what he says...because he is great at verbalizing and communicating. She said I could come in and meet with her and she can give me tips and tricks to try at home. Thank you, but I still felt like crap. Jim didn't answer when I called him, so I did the next best thing...text Jess to get her thoughts. Thankfully she is the BEST and called me right away and we chatted. Basically, Mac CAN make those sounds but just isn't (when we have him exaggerate the "k" sound, he can) and that is a good thing. If he physically couldn't make the sounds, we'd have a much bigger problem to deal with. She also said that "k" and "g" are harder to learn because they are in the back of the throat and his substitutions ("t" and "d" respectively) are common and appropriate. I felt SO much better after talking with her and she basically said to try to work with him for 5 minutes a day in a fun game-playing way and that it will come. I really appreciated her perspective and advice. As any other parent knows, any time your child struggles or lags behind in any area, it is hard. And if anything positive came out of our early journey with Finn, is that I learned how to advocate for my children and know when things aren't right. Mac's articulation isn't "right" but at least I know it isn't a huge deal right now. We can check into private speech therapy but that usually isn't covered by insurance and gets really expensive real quick. So we are back into a "wait and see" holding pattern. I don't like waiting. In the meantime, I'll just keep loving this beautiful face. I told him right before this picture that I was going to kiss his face until it fell off! He thought that was hilarious! And yes, he's wearing PJ's and one of my workout headbands!